UDM Downloads > River Past Video Slice! 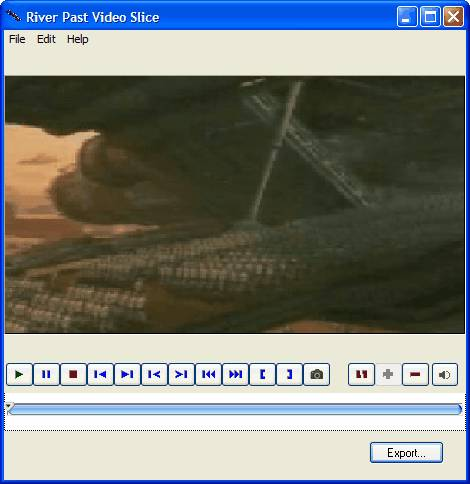 River Past Video Slice is an easy-to-use and fast video trimmer and splitter software for cutting the video to the exact frame for your editing and authoring needs. It provides a preview window with full control, including play, pause, stop, and frame accurate step backward and step forward. This allows you to get to the exact frame for the editing. It features a clear time line editing window, allowing you to trim video and/or cut video into segments. Both continuous and discontinuous segments are allowed. It accepts a wide range of video formats, including 3GPP/3GPP2, ASF, AVI, DAT(VCD), DivX, DV, FLC/FLI Flic animation, animated GIF, Matroska MKV, QuickTime MOV, MP4 (MPEG-4), MPEG-1, OGG Media OGM, RealMedia RM/RAM, WMV, and XviD. You can either output to AVI, WMV, DivX, XviD, DV, MKV or OGM. You can choose your video and/or audio codecs, video quality, video size, frame rate, audio sample rate, channel, and bitrate. For AVI input, you can remultiplex the file to AVI without reencoding with super fast speed. The original video quality is preserved, and it takes less than 1% (often just seconds, depending on the length of the video) of the time if the video is decoded and reencoded. With Animated GIF Booster Pack, you can output the video to animated GIF files. This is the easiest way for web masters to create moving thumbnails for the video. You can output the video to FLIC animation file. With Image Sequence Booster Pack, you can output the video to still images, including BMP, GIF, or JPEG files. With MOV Booster Pack, you can convert to QuickTime MOV movies. With MPEG-4 Booster Pack, you can convert to MP4 movies. With the optional 3GP Booster Pack, you can output to 3GPP or 3GPP2 video.You have Now, you can add a DirectShow decoding method (file reader, splitter, decoder) to expand the input file format support. No adware or spyware. DirectX 8 and WMF9 required (download link available on the web site). 30 day MONEY BACK GUARANTEE.